At Prescott Gold and Silver we do estate appraisals, estate jewelry appraisals, and appraisals of coin collections. We also buy and sell precious metals, silver and gold coins, and jewelry. We will help with liquidation of estates that contain precious metals, diamonds, numismatic coins, and coin collections. Many times heirs inherit estates with coins from a family member who was a coin collector. Unless you were also a coin collector, you have no idea if the deceased was collecting valuable coins, or simply junk. Who can you trust to give you an honest appraisal of the coin collection’s value? I would suggest that you get 2-3 appraisals of the coin collection’s value, from 2-3 different liquidators who specialize in coin collections. I believe that of all the gold buyers, and coin dealers in the area I would give you an honest appraisal of a few coins, or an entire coin collection’s value. As a coin collector myself I can easy judge a coin’s value based on condition, rarity, collectibility, and age. Whether you know it or not, just being old does not make a coin valuable. Collectors buy coins based on their condition. The better a rare coin will grade, the more it is worth. Other coins may only have bullion value. 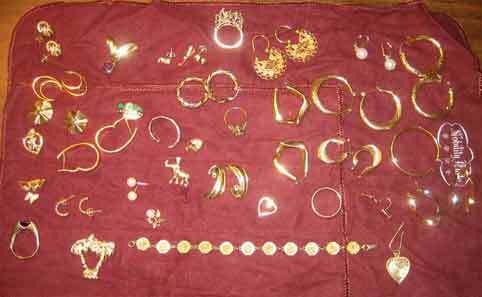 When it comes to estate jewelry my experience as a scrap gold dealer for several years is very helpful. Your estate jewelry’s value will be based on it’s condition, collectibility, and rarity. If there are any unusual items I will be able to give you a good idea of their value, and apprise you of how each item should be disposed of. If you are homebound or unable to travel, I sometimes do mobile gold buying. In the case of estates of gold jewelry, coins, coin collections, or larger lots of jewelry, you may call me to schedule an at home gold buying appointment. Please call me for an appointment to appraise your estate. Appointments daily from 9 to 5. Monday through Saturday.